1. In a large bowl, sift together the flour, baking powder, and salt. Add the milk and sugar (if using), and whisk until smooth. Beat in the egg and gently mix in the corn. 2. In a large skillet, heat about 2 tablespoons oil over medium-high heat. Drop 2 to 3 tablespoons batter into the hot oil and carefully flatten the mixture with the back of a spatula to form a fritter. Cook for 2 to 3 minutes on each side, or until golden brown. Repeat with remaining batter. 3. Serve hot accompanied by maple syrup with a dollop of butter placed on top of the hot fritters, if desired. Note: if your corn is very fresh and sweet you won’t need to add any sugar, but if the corn is frozen or not just-picked, you may want to sweeten it with the addition of some sugar. 1. In a large skillet, heat 1 tablespoon of the oil over low heat. Add the onion and season well with salt and pepper; cook for 10 minutes, stirring occasionally, until the onion is pale golden. Add the greens in batches, stirring them into the onion and cooking for about 5 minutes, or until they are just wilted. Remove to a plate. Let sit for 5 minutes and then place another plate of the same size on top and squeeze out the liquid from the greens. Set aside. 2. Add the remaining ½ tablespoon of oil to the same skillet over medium heat. Squeeze the sausage meat out of the casings (discarding the casings) and, using a spatula, crumble the meat into small pieces. Cook for 10 minutes, stirring frequently, until cooked through. Drain on paper towels and set aside. 3. Crease a 3-quart gratin dish (14 x 10, or 13 x 9 inches) with the butter. Line the bottom of the pan with half of the bread, creating an even layer. Scatter half of the greens and onion mixture on top of the bread. Scatter half of the sausage on top. Finally, add half of the cheese on top. Repeat with the remaining bread, greens, onion, sausage, and cheese. 4. In a large bowl, whisk together the eggs and milk. Add a generous dash of salt and pepper and the thyme and whisk vigorously. Pour the mixture evenly over the bread. Cover with plastic wrap and refrigerate for 1 hour and up to 8 hours. 5. Place a rack in the middle of the oven and preheat the oven to 350 degrees F. Bring the strata to room temperature before baking. Bake the strata for 45 to 50 minutes, or until the egg custard is completely set and the top of the strata is golden brown. Let sit for 5 to 10 minutes before serving. 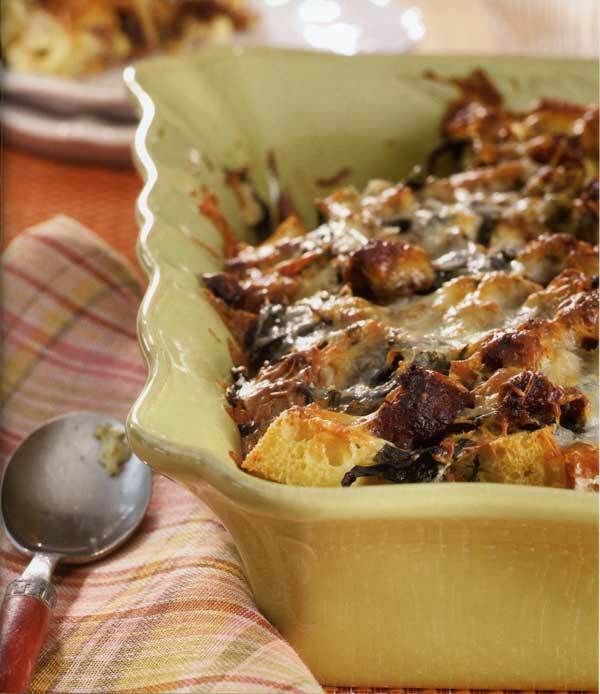 Note: Like good stuffing, a good strata depends on good bread. Use bits and pieces of leftover bread (be sure it’s not moldy or rock hard) and feel free to use a variety. And be sure to use the bread crust for a good texture. 2. Place the panko, flour, half of the basil, and a generous dash of salt and pepper on a large plate and mix well. 3. Lightly coat the tomato and zucchini slices in the seasoned breadcrumb mixture, pressing the vegetables gently into the mixture to make sure it adheres well. 4. Heat a large, heavy skillet (cast iron is ideal) over medium heat. Add the oil and butter and heat for 10 to 20 seconds, or until almost sizzling. Working in small batches, being careful not to overcrowd the skillet, add the zucchini and cook for about 3 minutes on each side, or until golden brown and tender. 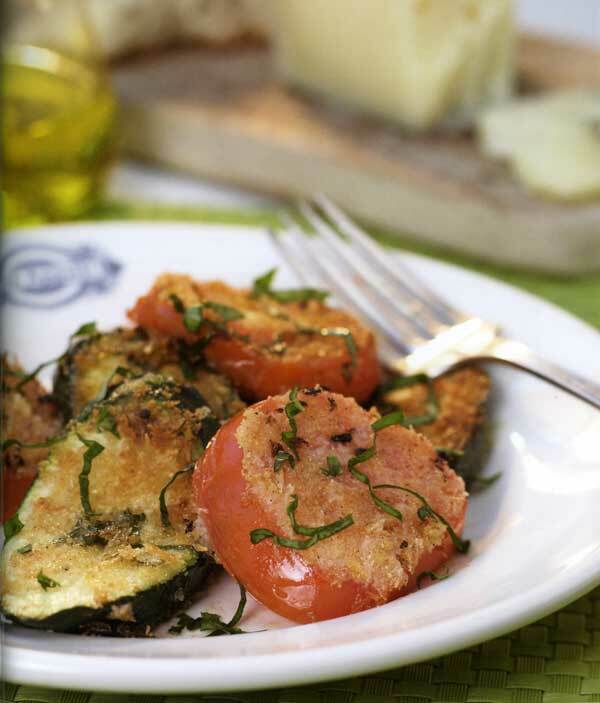 Place the cooked zucchini on an ovenproof plate and keep warm in the preheated oven. 5. Then cook the tomatoes for 2 to 3 minutes per side, until crisp on the outside and soft (but not falling apart) on the inside. The time will depend greatly on the ripeness and freshness of the tomatoes and zucchini and the type of skillet you use. 6. Serve immediately with a sprinkling of the remaining basil on top; the vegetables tend to “wilt” if they sit around too long. 2. Using the large openings of a box grater, grate the tomatoes into a small bowl. Season with salt and pepper and add half o the basil. 3. Place the bread on a cookie sheet and, using a pastry brush or the back of a spoon, brush on half of the oil. Place under the broiler for about 1 minute, or until just golden brown. Flip the bread over and sprinkle on the cheese; broil for another 30 seconds to 1 minute, until golden brown and the cheese is bubbling. Alternatively you can simply broil the other side of the bread and sprinkle the cheese on top o the tomato at the end. 4. 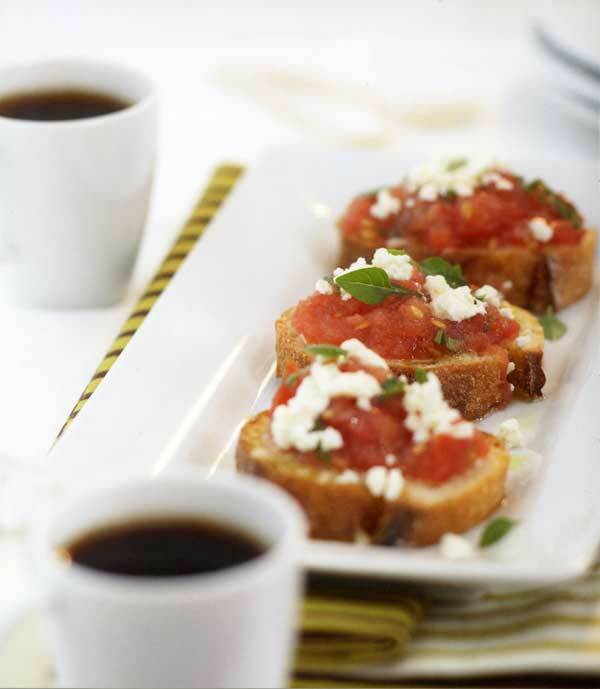 Spoon the grated tomato on the top of the cheese toast and drizzle with the remaining olive oil and basil. Add a light seasoning of salt and pepper. 1. Place a rack in the middle of the oven and preheat it to 400 degrees F.
2. Lightly coat 12 muffin cups with the vegetable spray. 3. In a large bowl, whisk together the flour, baking powder, baking soda, and salt. 4. Beat the butter in a stand mixer with the paddle attachment or using a hand-held mixer on medium speed, until creamy. Add the sugar and beat for about 4 minutes, until light and fluffy. Add the eggs one at a time on low speed, using a spatula to scrape down the sides of the bowl. Add the vanilla and mix to combine. 5. Add half of the flour mixture and mix on low until blended. Add the sour cream and mix until combined. Add the remaining flour mixture and mix until just combined. Remove the bowl from the mixer and, using a soft spatula, gently stir in the peaches and ginger, making sure they are will distributed in the batter. 6. 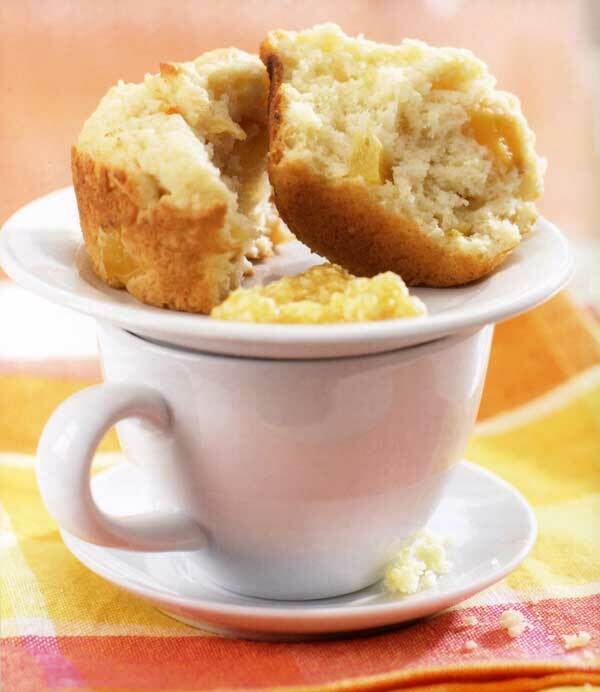 Divide the batter between the prepared muffin cups, filling each one almost full. Bake for 20 to 25 minutes, or until the tops of the muffins are golden brown and a toothpick inserted in the center comes out clean. Cool the muffins in the pan for about 5 minutes and then, using a table knife, gently lift the muffins out of their cups and place them on a cooling rack. Serve warm or at room temperature. 1. Place the peaches in the container of a food processor or blender and whirl until blended. You can keep the fruit chunky or puree it until smooth. 2. 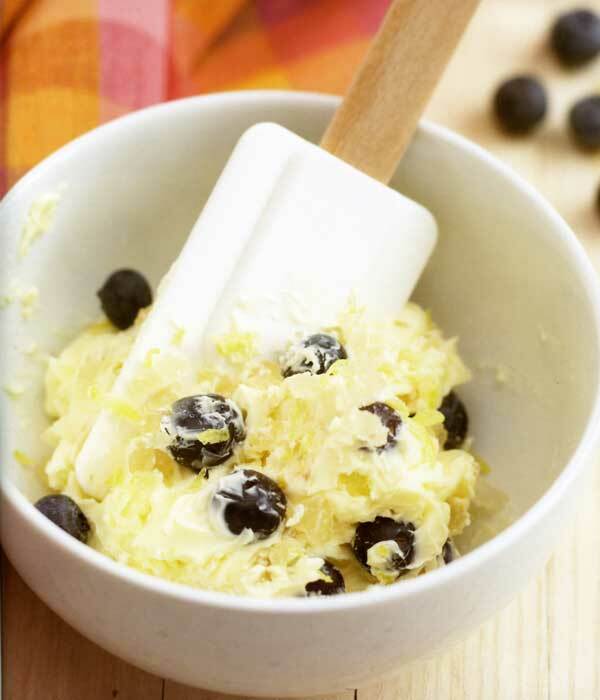 Place the butter in a small bowl and cream it with a soft spatula. Add the peaches and the ginger and stir until well incorporated. Place into a small ramekin or bowl and chill for at least 30 minutes before serving. The butter will last for 48 hours.